Fare-Free Pittsburgh: Registration Now Open for the 2014 Pro Walk/Pro Bike/Pro Place Conference in Pittsburgh! Registration Now Open for the 2014 Pro Walk/Pro Bike/Pro Place Conference in Pittsburgh! 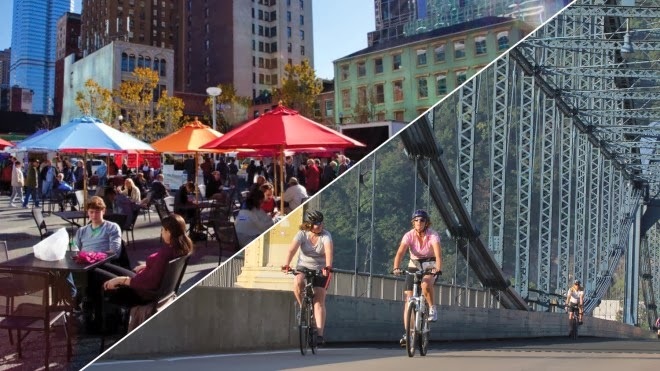 Project for Public Spaces: "If you’re anything like us, a conference entirely about complete streets, public health, and placemaking is the highlight of the year! And you’re in luck – We are happy to announce that early-bird registration is now open for the Pro Walk/Pro Bike/Pro Place Conference, the premier active transportation conference in the world. Join us in Pittsburgh, PA this September 8-11 along with over 1,000 participants from all over the world including planners, architects, public health professionals, realtors, educators, advocates, and more than a few zealous nuts just like you!"